I'm loving these sweaters that I picked up from Ann Taylor. They are pretty thin so they are perfect for my warmer climate, and I love that they can be tucked into skirts for work without adding bulk. This is my first time showing my new Ann Taylor Factory suit on the blog. I bought it a few months ago during a trip to the local outlets. I find that the material feels much cheaper and not as nice quality as my other suits, but I think the "quality" is more noticeable to me and my skin than to anyone else. I was drawn to the deep burgundy/ slightly purple color - I haven't seen any other suits this color and it's nice to be able to wear something other than black/grey/navy to court. 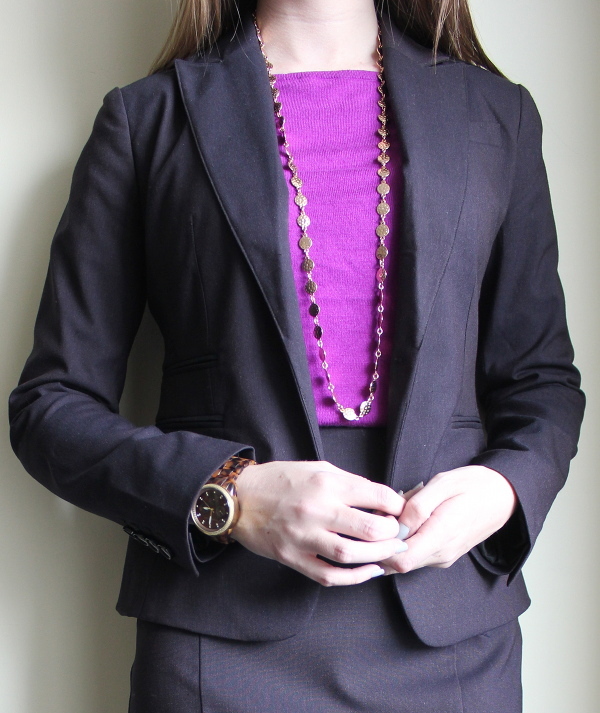 Great professional look - and I like the purple paired with the tortoise accents. that color is AMAZING! in a sea of gray/navy/black, this is just a perfect shade!